Mercury also known as the messenger of the Gods is a fast moving planet that rules the signs of Gemini and Virgo in Vedic Astrology. This is the planet of humour, wit, communication, accounting and finance, business and management. It also controls the sectors of the information technology, internet and information technology enabled services. Strong mercury in the birth chart is excellent for entrepreneurs or those in the field of business. It keeps the mind sharp, focussed, and helps in ideating and taking business decisions quickly with convictions that are favourable and profitable in the long run. 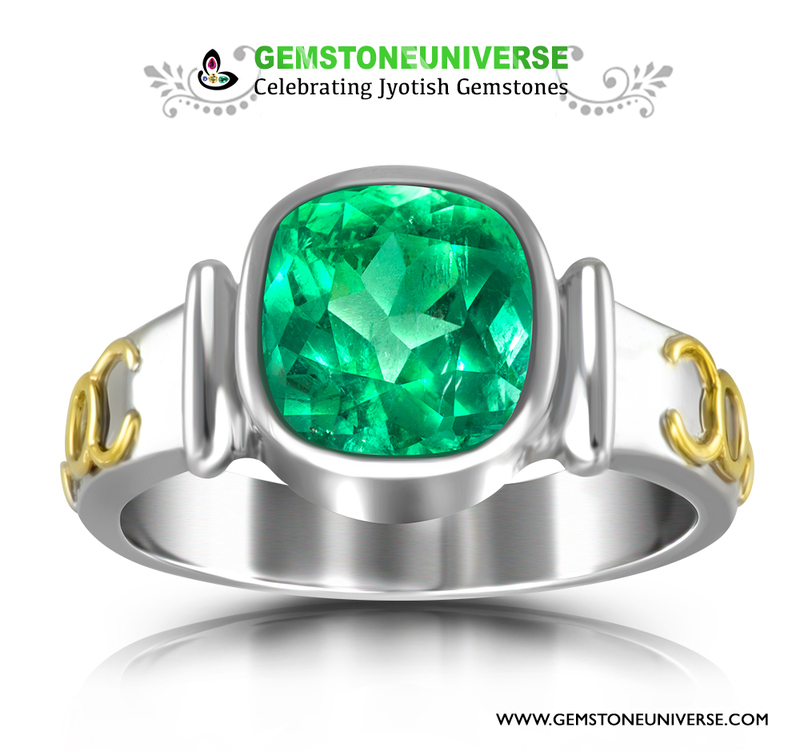 The Jyotish Gemstone ascribed to Mercury is the Emerald- the precious green variety coming from the mineral family of beryl. A soft gemstone it is precious, valuable, durable and has consistently been in the group of the big 3 of the coloured gemstones world- Ruby, Emerald and Sapphire. A powerful gemstone that harnesses the positive powers of Mercury it is an excellent gemstone in whose horoscopes Mercury is strong and controls auspicious and powerful sectors in the birth chart. 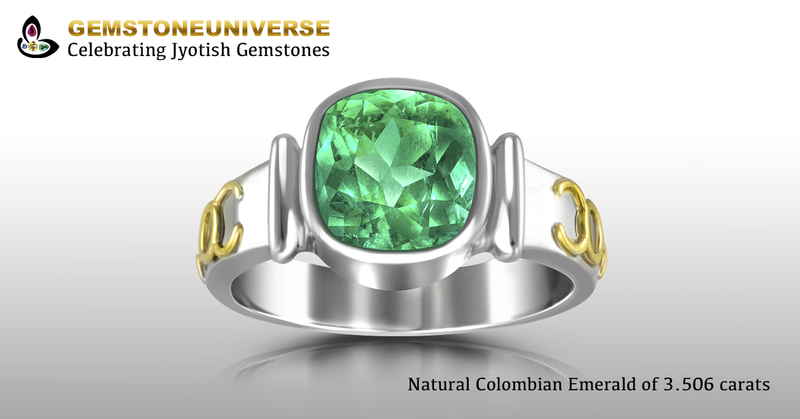 Featured today is a bright and lively Colombian Emerald. The singular feature that stands out in this beautiful gemstone is departure from the regular. Notice the Fancy cushion cut with several facets that makes the movement of light magical as well as optimal. Even though 90% and above of fine emeralds have the classic and the conventional emerald cut this Gemstone gets its distinct personality and draw by having the fancy cushion cut. Natural Emerald is almost always an included gemstone and it rests in the hands of an expert to Judge Emerald clarity especially for Jyotish Purposes. At 6X magnification in the video you can assess and make out that this Emerald has great clarity. The colour is alluring and full of life. It is almost a bright parrot green one of the sacred shades of emeralds mentioned in the sacred texts that deliver good results. Set in a talismanic ring with the sacred symbols of Mercury on the ring shanks. The sacred herb of Mercury is sealed in the two tubes around the Colombian Emerald making it a powerful Jyotish Gemstone talismanic ring that shall deliver results only true Jyotish Gemstone are capable of.